Viewing 1 - 9 out of 21 Blogs. 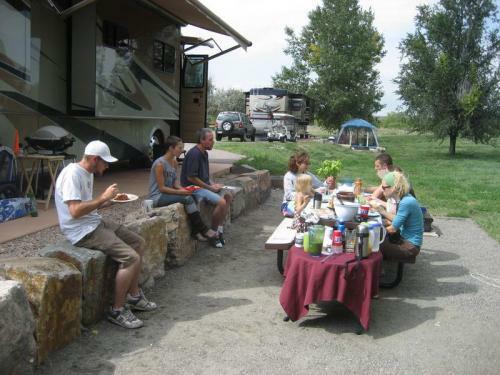 Quartzsite - How Much Does Free Camping Cost? A quick wrap-up of our first 12 days in the desert. One of our reasons for doing this was to save some money on camping costs, so we wanted to see how much this "free camping" would actually cost us. I am doing "rough numbers", but they are pretty close. We stayed in the BLM Dispersed Camping Area called La Posa North LTVA (Long Term Visitor Area). We filled water, propane, and diesel just before going out to the place we would park for 12 days. We ended with just under a quarter tank of fresh water at the end of the 12 days. We refilled our jugs of drinking water one time during our time out there, which we used for drinking, cooking, and coffee. The generator was run for a total of 52 hours during that time. $128 for 12 days of camping comes out to about $10.70 per day, or about $75 per week, or about $320 per month. Having just come from Malibu Beach RV, that number seemed VERY low! Was the cost worth the adventure? By all means, yes. As Technomadia said, it is kind of like being at Burning Man, without the Thumpa-thumpa, and the cool costumes. We met some really nice people, and had awesome walks, and saw the most incredible sunsets. We also learned a lot about how our normal consumption of resources is usually without thought, and it would be better to start thinking about it more - apply some boondocking techniques to our normal lives. We are closing out our fifth day here in Quartzsite, and we are starting to feel like boondocking pros. We are feeling like pros because: we are still out here in the desert after 5 days; we have only used ~1/4 tank of water (25 gallons or so); and we are having a great time! Ang and I have been living pretty normally - I get up and work all day, we walk the dog together a couple times throughout the day, we make dinner and have a cocktail and watch the sun go down. We watch a little TV together, she dozes off, and I go back to work. That is a pretty normal week for us. However, being off-grid, we have had to make slight adjustments HOW we do these things. Sunset is a beautiful time in the desert! We have figured out that the consumption of resources is the most obvious thing when boondocking. I think that doing this makes a pretty big statement about our society - in normal lives, we consume because there is always more. We run the shower longer. We run the water endlessly to brush our teeth. We leave lights turned on. We throw stuff away without thinking about where it goes. We all do this because there is always more where that stuff came from. However, when there is an end to the consumable resource, a guy thinks twice about how it is being used. The batteries run down quickly, so we turn off extra lights. We turn off the DVRs and the computers at night. We sparingly use water. We refill containers. We re-use water that would normally be wasted. We think about where our resources are going every time we use them out here. Hopefully the above two paragraphs didn't come off as preachy, but more in a self-realization kind of way. Our 5 days here so far have been an awesome experience! We have found a few things that have really helped us watch our consumption and stretch our resources that I would like to share. Fresh water is a very obvious depleting resource because you can watch your tank drain down. Using water carefully has been a challenge, but we have been doing real well. From our fresh water tank (100 gallons), I estimate we have used less than 30 gallons between the two of us in 5 days. We have supplemented with R/O water we get from refill stations in town, but we normally do our drinking water this way. If liquid is going down the drain, it is going into your gray tank. There are services that come around here to pump out your tanks (honey wagon), but it is costly. Driving to the dump station is not a lot of fun either. Conserve waste water to stretch that time out. Always keep your hand on the faucet when using water. Use what you need, then turn it off. Catch the water in the shower and sink in a pitcher while you wait for hot water to come. The shower only takes a little bit to warm up, but that is water that can be used for so many different things. It is fresh, clean water that would normally go into your gray tank! Keep a large bowl in your kitchen sink to help with doing dishes. Rinse water can be used to help wash more dishes. You can pour used ice in there. The water in the bowl (food particles removed) can be tossed outside if bio soap or no soap is used. It also shows you how much water you are using to do dishes! Use jug water for coffee. It is easier to refill a jug in town than drive your rig to refill your tank. I am a two pot a day guy, so that can end up being quite a bit. This has been a challenge for us. We are normally hooked up to shore power at campgrounds, so keeping things on comes without a thought. When you watch the volt meter drop down and down and down, you learn real quick that you HAVE to turn things off. Know your capacity, and how to recharge. We have only a generator to recharge our system - no solar (yet!). Because of this, we came up with a schedule - genny on first thing in the am - coffee, recharge, breakfast. Short run in the afternoon to bring charge back up a little. Genny on in the evening for full charge - dinner, dishes, TV, getting ready for nighttime. Have a good battery meter. The one built in for our inverter shows amp load on the batteries. We use that to see when we have too much running. Turning things off has an immediate affect on that number. Know that 120V items take more power than 12V items. If power goes through the inverter, it will have a power loss. Use 12V if you have the choice. When possible, plug 120V items into a power strip that you can shut off with a switch. It really helps to shut items down even if they are turned off. Found out my surround sound/DVD player has ~12A load while off! We are using solar lights at night instead of house lights. They are cheap, cool solar lights that charge up all day, then we lay them around the coach at night as night lights. Group electric activities while the genny is running. Charging phones and accessories, making coffee, microwave, furnace, etc. The above are a few of the things we have picked up so far. There are a ton more of things you can do to extend your resources. However, I do think that the most important thing we will take from this is that we should be careful in our on-grid life, just as we are during boondocking. It may seem like our resources will always be there, but we know they won't be. We should use them like they will be gone tomorrow, every day. Next time: keeping warm at night while watching your battery voltage drop like a rock. I thought I would make some notes about Quartzsite since it is a popular place with the RVers. This is the first time we have "stayed in Quartzsite" - as most people think of it. We have stayed in Brenda, which is about 15 miles up the road from here, in a full-hookup campground. We have been into town to have a look around, but it was during off season. We are now really in Quartzsite. In the desert. BLM land. Boondocking. With a few thousand friends. We blew in here on Friday - New Years Day. It was an easy drive from the west, only a few hours from where we overnighted. Our plan was to get into town and fill up our liquids - diesel fuel, propane, and fresh water - 100 gallons of onboard and a R/O drinking water containers. We found all but the fuel at the RV Pit Stop, which is on Hiway 95, on the north part of town. These guys were ready for a ton of rigs. They were very efficient and set up well. We took 25 gallons of propane, and the water fill was $3 for a whole tank. Ang filled the drinking water for 25cents a gallon. From reading on the web, I knew I wanted to give La Posa Long Term Visitor Area (LTVA) a try. It is cheap at $40 for 14 days, and has trash, water, and dump stations. Figured it would be boondocking training wheels for us. We found it easily as we headed south out of town and stumbled upon "La Posa - 1/2 mile ahead" signs. We pulled in to find the ranger station closed for the holiday. We decided to park the rig, unhook the Jeep, and drive around to find a place to park. It is surprisingly difficult to find a parking spot when you can select from "anywhere". Literally, anywhere. I think their only rule is that you can't block a road. Other than that, the desert is there for the taking. Me: Do you have any preferences? Angie: Umm, no. It pretty much all looks the same. Me: What about over there? Angie: Sure. Looks like right here though. Me: Ok, lets park here then! I have a tendency to overthink, or over analyze things sometimes. Ang tries to help my nerosis by keeping me on task. It works well for us. However, she did decide to take Malabar for a walk while I moved and repositioned the RV a solid 10 times before being satisfied with our parking position. I got out the final time, walked a distance away to admire my amazing parking job, and discovered that I was parked completely opposite of how most people were parking their rigs. Everyone was pointed southward, while I was perpendicular, facing east. It is satisfying being the only right one. We like it out here so far. It has a serenity that we have not seen for a while. It is challenging trying to do the crash course in off-grid living. We are learning ways of saving and conserving and reusing and showering quickly. Learned that the furnace LOVES battery power, and consumes it quickly. Also learned the sunsets out here are not to be messed with. Next up: A dozen uses for dishes rinse water, and Swapmeetville, Arizona. We pulled into our new campground yesterday, went through the routine of slides out, umbilicals plugged in, level out the coach, drag out the BBQ. All the normal things. After a short lounge in the Parlor, I stepped into the bathroom and was surprised to find my socks soaked with water. Opened the lid to the toilet and found it overflowing! Rushed outside and shut off the water and started mopping up the water running through the floor and into the basement!! Weak way to start at a new place. Figure it must have been a particle that shook loose while driving down the road and got stuck in the water valve in the toilet. Hasn't done it since, but my toilet is now under 24 hour surveillance! Hey! You in the Tercel merging onto the freeway! When merging onto a freeway, it is a good idea to have a look at the oncoming traffic while you are on the ramp. The last dash of the white line on the merge lane is not a good time to look over at oncoming traffic for the first time. Another thing is that the freeway onramp was built to your advantage. Even though your Kia is pumping out almost 100 horsepower, the ramp is usually at a decline down to the freeway, giving you physics to speed that thing up. There really is no reason to be at my front bumper while I am doing 65 and you are doing 40. You just came down a big hill. I have been driving on the flat for miles. You really can get up to speed by the time you hit the freeway!! Finally, you may have seen a triangular sign somewhere on that onramp - it is a Yield sign. Now, this is not a sign letting you know what to expect other traffic to do. Conversely, it is assigning you an action item for this freeway onramp transaction - YOU need to yield. That Yield sign takes away your right to flip me off when you find yourself at the end of the merge lane and you have seen me for the first time - 65' and 35k pounds, merely inches from your 3200 pound Altoid can. You may NOT be upset with me because I've been here the whole time! All you had to do was glance over. You would have seen me long before now. I don't even think I am asking for a whole lot - just a little heads up driving. Trust me - it is a lot more difficult for me to slow all this down to yield to YOU, and then get it back up to speed. I promise you - I would move over if I could. Just because you can't see the two cars and a motorcycle on the other side of me doesn't mean they aren't there. I won't take them out just so you can merge on the freeway at 45MPH without even looking. Don't even get me started on freeway onramps on a hill climb. That's right - no bingo. No bean bag toss. No ladder golf. No square dancing, or Tony Orlando, or whoopie cushion record breaking attempt. Just good friends, dynamite food, and bountiful Colorado sunshine. The owner of the Broken Bow RV Park had mentioned something when I checked in that made me open up my GPS mapping software again. I had mentioned that we would leave Escalante in the morning and drive north on Hiway 12, then to Hiway 24 through Capitol Reef NP. He said something like "oh, that way". Huh? What do you mean "that way". "I hope you have good brakes in that thing". No problem, right? I can handle these.... right? No worries - I will deal with them when I get there. I was on a mission. The drive out of Escalante was more of the incredible countryside we had been enjoying on our 2-lane adventure. A little ways from town, we hit our first big "obstacle" - an incredible descent into the depths of Perdition (well, almost). The descent was a couple of miles of 6ish percent grade, but was complicated by being behind a RENTAL RV!! Climbing out of the bowl, and still behind the rental RV, we were treated to some amazing canyon views. It is really difficult to pilot 65 feet of 40k pounds of diesel-breathing beast while trying to take in some of the most beautiful scenery I have ever seen! However, once we reached the top of the climb, all of my attention was needed for one of the trippiest roads I have ever encountered - a true "ridge-top" road known as "The Hogback"! I realize that the photos don't really capture the vibe on this road, but it is a little spooky snapping pictures while driving on this. There is a few inches of shoulder on each side of the road, followed immediately by sheer dropoffs to the canyon bottom below! The rental RV finally threw me a bone and pulled into a turnout. Just down the road was a beautiful little town called Boulder, which was right in the middle of Anasazai Indian Village State Park. We parked just outside of town in a little turnout so that I could make a phone call, which turned out to be the rest needed for the next leg of the journey. The leg referred to by the statement "I hope you have good brakes in that thing". The downhill was a little stressful. We are running pretty heavy, and I worked my best magic with downshifting, exhaust brake, stabbing the air brakes only when needed. There was a cornucopia of 6, 8, and 10% downgrades. Ang missed all the downhill fun - she was crashed out through the whole edge-of-out-of-control adventure. Once the downhill ended, we coasted through the town of Torrey, and went east on Hiway 24 - and right into Capitol Reef National Park. Another set of Wows gave me the courage to try something that I rarely am brave enough to do - try to wake Ang from a nap. It was worth it. The park was absolutely incredible. We stopped at a nice parking area in the middle of the park. It was close to the river, so there were trees and plants and coolness. We took a walk around the wood platforms and saw some great "wall art" - ancient art/stories/communications by the native indians of the area. This, however, solidified my theory that aliens actually live in these towering mountains, and the natives recorded their oddness for eternity in their art. Another nice treat in this parking area was access to the original fruit orchards that the Mormon pioneers planted in this area. I ate a green apple from one of the trees and it reminded me of doing the same as a kid at our cabin near Mt Shasta. Green apples picked out in the middle of nowhere seem to taste better than anything you can get in a store. heh - shady. I paid our $18 for the night, and Ang and I walked around the campground. We didn't find one spot we were comfortable pulling our rig in to. If bushes could have bed head, this is how we would describe them. We were able to find a place big enough for us to flip a U-turn and get back on the highway. I just hope they use my $18 to make their campground less "shady". So, it was off to Moab. It was only two hours, and we arrived at our campground just before dark. We were happy to be "home" for the next couple of weeks. Leaving California is never easy - saying goodbye to family and friends, wrapping up business, swearing at our storage one more time... Always way too much to do before we leave. This departure was also dotted with maintenance on the RV - full lube, some minor repairs. Getting ready for the road ahead. Leaving California is always difficult in another way - Cali has some of the worst roads we drive on. It is never fun to look forward to several hours of teeth rattling, light fixtures falling, and general "contents WILL shift during flight" issues. However, we did have something to look forward to with getting out of Cali - next stop Moab, Utah! Well, maybe not the "next stop", but the next destination for sure. We were quite happy to be heading off to Moab. Ok, I was quite happy. Ang was along for the ride - always game for the next adventure. Moab has been one of those places that has always eluded my travels. I have wanted to go there since I first read about it when I was mountain biking. It just seemed like the place to go. Now, with dragging the Jeep behind us, I had renewed interest, and had been trying to get it into our travel plans for quite a while. The trip out of Cali was pretty uneventful. We passed Angie's favorite provider of yummness - Bolthouse Farms. She was awake to see it! As we approached the California border, we kept seeing corny signs for "The Best Gyro in USA!!". So, a stop at The Mad Greek in Baker, Ca. (home of the worlds largest thermometer!!) filled our bellies before we left the state. Tiredness hit at around 2am when we rolled into Mesquite, Nv. I had wanted to get out of Las Vegas while it was night time, as I had no desire to deal with that place during daylight hours. Mesquite turned out to be a pretty neat little town, and we found a cool casino with an RV parking area that allowed us to park for the night. Once we were out of Nevada, the Ahhhhhhhhs turned on - big time! The tiny part of Arizona we drove through was beautiful - big canyons and nice roads. Once we were in Utah, it was time to start looking for the off ramp to start our 2-lane adventure! We got off of I-15 just past St. George, Utah. We really didn't know what to expect, but after looking at the maps for a week or so, I figured we could handle anything the 2-lanes were going to throw at us. Our first lesson on AWESOME was shortly after we left the interstate hell - Zion National Park. The warnings were a little intimidating, but we figured we weren't the first motorhomers to drive through the park. As we stopped at the gate to the park, we were informed that we were too long to drive through the park, so we would have to unhook and Ang would have to follow behind me. No big. Then came the real news - there is a tiny little tunnel that we have to go through, and because of our size, they have to shut the traffic down so that we can drive down the middle of the road. No big. I can do that. Then the downside of all that - it was going to cost us $40 to drive a few miles through the park, including the $15 tunnel charge! However, after driving a little bit through the park, I decided that $40 was a true bargain. This place put the awe in awesome. The tunnel was just an added bonus! The drive through the park on Hiway 9 was amazing. We were able to stop a few times, take some pictures, dig the beauty. Once we left the park, we were treated to hours and hours of beautiful country. Zion NP had a high concentration of beauty, but the whole drive had something to offer. At Mt. Carmel, we headed north on Hiway 89, then jumped on Hiway 12 east which took us through the top part of Bryce Canyon National Park. We didn't get to really see much of the park, as we decided to continue heading east. We found out about half way through the day that we were now on Mountain time, and since we didn't have campground reservations for the night, we were hoping to get to Escalante, Utah, before nightfall. We found our spot for the night at the Broken Bow RV Park. Not a fancy joint, but exactly what we needed after a few days on the road - food and cocktails right across the street! Check out the rest of the pictures in the Gallery - cal2utah_001.jpg through cal2utah_027.jpg.